Shows slaves at work in the processing of sugar. On the left (B) is the tank that receives the cane juice flowing from the mill where the sugar cane has been crushed and the juice extracted. 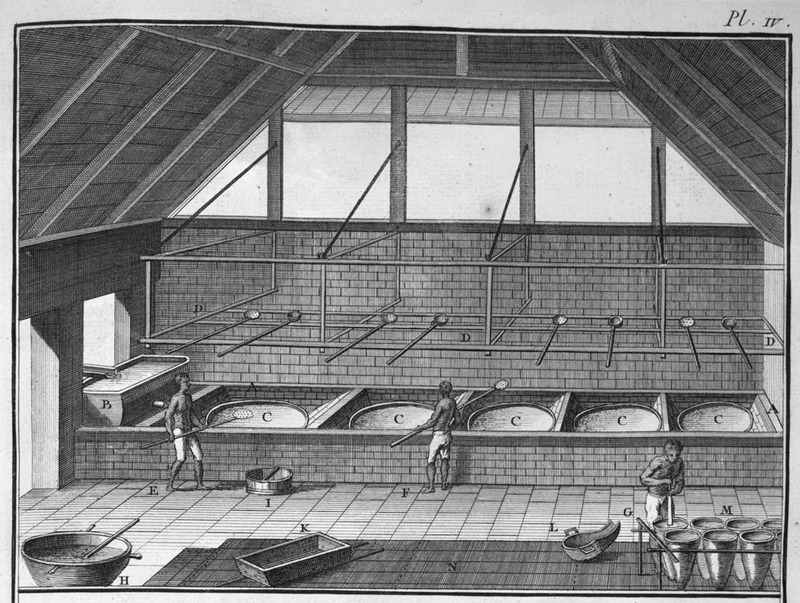 In the center are the coppers (cauldrons) in which the sugar juice is boiled (C) with slaves moving the crystallized sugar from one to the other with giant ladles (D). On the lower right are the conical sugar pots into which the raw sugar will be placed and then taken to the curing house to drain out the molasses. A reversed version of this image is in M. Chambon, Le commerce de l'Amérique par Marseille (Avignon 1764) Vol. 1, plate IV (top), after p. 382), titled Sucrerie.